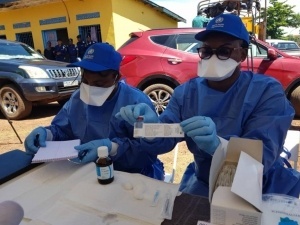 Experimental Ebola Vaccines Distributed in African Congo by World Health Organization (WHO). Image source . There is now another Ebola breakout occurring in Africa, this time in the Democratic Republic of the Congo (DRC). This is following the 2014 outbreak in Sierra Leone, which prompted pharmaceutical companies to begin development of an Ebola vaccine. The 2014 outbreak in Sierra Leone is reported to have claimed 11,000 lives. The World Health Organization (WHO) is reporting  that the “yet-to-be-licensed rVSV-ZEBOV Ebola vaccine” will be distributed in the DRC. The vaccines are donated by Merck, while GAVI, the Vaccine Alliance funded primarily by the Bill and Melinda Gates Foundation, is contributing $1 million towards operational costs. Treating and healing Ebola victims with ozone therapy before the Sierra Leone government was pressured to shut it down. Image source Dr. Robert Rowen Facebook Page . In 2014, American doctors Robert Rowen and Howard Robins went into the Sierra Leone heart of darkness with donated ozone generators and facilitating apparatus to treat those infected with the inexpensive, safe, and highly effective, but not FDA approved, ozone therapy (OT). They gathered some local medical practitioners and began training them with application of the procedures among Ebola victims in their region. 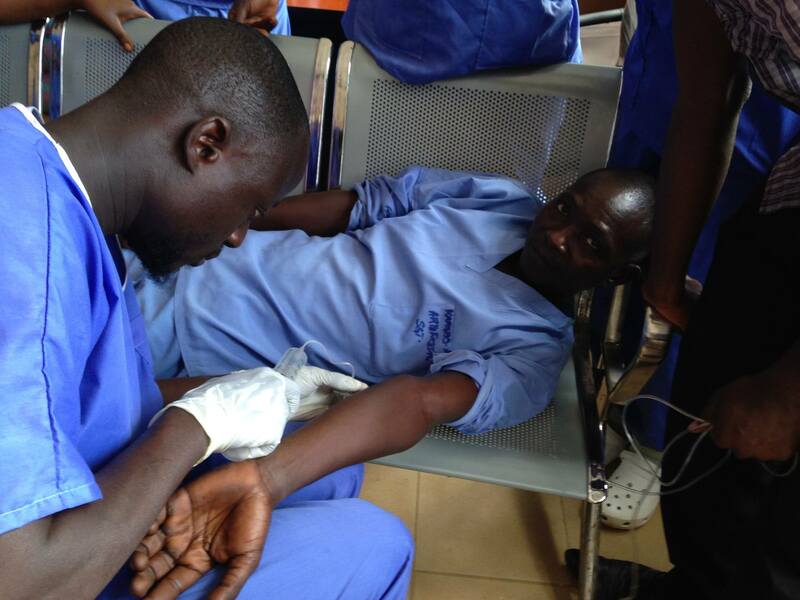 The doctors’ humanitarian effort was done at their cost and time with donated equipment. The only other possible motive could have been to prove to the world that ozone therapy is very safe and effective for several medical conditions, including Ebola. The pharmaceutical industry has the FDA police power to discourage doctors from using anything that’s inexpensive, effective, and safe from competing with the pharmaceutical drug cartel’s monopoly. After a short time in Sierra Leon, the doctors were forced to stop. Ozone therapy was banned. But it wasn’t just a ban. Doctors Rowen and Robins were attacked by Sierra Leone media as Americans “experimenting” medically on African Ebola victims and told to go home and experiment on Americans. After the initial ban was enforced, Rowen wasn’t even allowed to administer ozone therapy to one of the locals who had been trained to deliver it to others in his community. That person died an agonizing death over the next week. Dr. Rowen and Dr. Robins were forced to take their donated ozone generators and application apparatus and leave, even as the death rate among those infected rose to over 50 percent. This was baffling. Why would the region’s government officials and the media want to get rid of doctors who were healing their citizens from an often deadly disease with hardly any costs? An inside source who requested anonymity disclosed that the government decree to leave Africa and ban ozone therapy came from Big Pharma, via the WHO (World Health Organization), with the threat that if the American doctors were not kicked out along with their effective ozone therapy, the pharmaceutical industry working with WHO would pull out of all of Africa permanently. Today we see an “experimental” vaccine being doused on people but I was vilified by a Sierra Leone government official on their national television for coming to the country to “experiment” on Africans. Dr. Rowen also reminded his Facebook readers that vaccines are useless to those who are already infected. They are meant to be prophylactic (preventative). The only pharmaceutical designed to stop an Ebola infection in progress is expensive and not completely tested. Ozone therapy has been used throughout the world successfully for a wide variety of diseases, from cancer to viral and parasitic infections. Ozone is O3 while oxygen is O2. O3 is unstable. So it easily loses an atom of oxygen that other tissue or blood cells will readily accept. Ozone is created naturally by lighting. It’s that unique, mild fragrance in the air the makes one feel refreshed during a mild thunderstorm. It’s also part of that ocean air that refreshes on coastlines. Its instability is what helps break down to oxidize pollution, infections, pathogenic anaerobic microbes, and anaerobic cancer cells. They can’t handle high oxygen environments, but healthy cells and microbes thrive on it. Breathing concentrated ozone or O3 directly could harm the lungs, so it is not administered that way. The worst toxicity from high ozone warnings is usually because of the creation of smog as it combines with industrial and transportation pollutants. The ozone is actually attempting to neutralize the pollutants. Weather forecasters’ ozone danger warnings are based more on the man-made polluted smog ozone is trying to neutralize. That kind of warning would be similar to determining that cholesterol is the source of cardiovascular disease, because it has been spotted where it was attempting to repair arterial damage from chronic inflammation. Breathing O3 is not how the therapy is applied unless it is through a filter containing olive oil. It involves infusing mechanically generated ozone into a liquid that can be injected or administered by IV. Sometimes the blood is infused with ozone in a manner similar to dialysis. It’s withdrawn, passed through an ozone generator, then recycled back into the patient. It’s important to realize that Dr. Rowen is not experimenting or seeking patents. He is an avid advocate of ozone therapy. His successful clinical use of O3 in Alaska helped him initiate the legislation in that state which protects medical freedom and prevents doctors from being prosecuted while using ozone therapy. It is a standard of care in Germany for many diseases of all types, including cancer, and it is openly allowed in Russia, Cuba, Mexico, India, and Indonesia. The first ozone generator was created by Nikola Tesla in 1896. In spite of much of the rest of the world using ozone safely and efficaciously, the official position of the U.S. Food and Drug Administration (FDA) regarding ozone therapy still stands today. [The WHO is] too controlled by pharma. I doubt they will be interested in doing something that can actually save lives for about a dollar per person. Yet millions from the WHO, United Nations, and other international groups including GAVI, the Vaccine Alliance funded by the Bill and Melinda Gates Foundation, pledged to pay for a stockpile of 300,000 vaccine doses and other equipment to the DRC. No doubt payments will support the shipment of the costly, still experimental, drug ZMapp for those already infected, with yet another medical experiment on Africans. 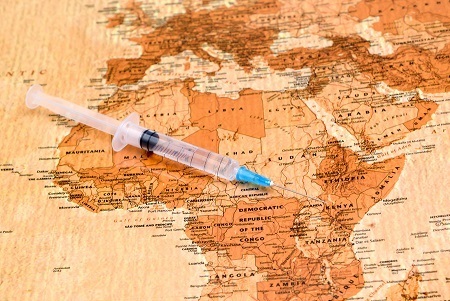 The costs of these mass vaccination programs were handled by various charitable organizations, such as the ones mentioned above and/or the African nations involved with the crimes. Dumping surplus oral polio vaccines and using them where there is no polio problem has also occurred in the past. Oral polio vaccines have been banned in the West because they created paralysis and actually contributed to cases of vaccine-derived polio as the vaccine carries a live virus that can be spread to others. This helped vaccine makers recover their losses from the ban but wreaked havoc on African children . The humanitarian cover works well for pharma profits. Some claim it also serves the depopulation agenda in Africa to allow various multi-national corporate industries to plunder its natural resources without hindrance. Someone commented on Dr. Rowen’s Facebook page that he should contact Ben Swann, Reality Check , to whom Dr. Rowen replied that he had recently reached out to Ben Swann with his situation. But he feels it would be better for others to offer the true Sierra Leone story as well, for a strength in numbers. I would be grateful if you would flood media links and DRC embassies with the URL at the bottom of this page and ask them why they are permitting the words “no known cure” when there is a published report detailing a possible 100% cure most people could afford, even in the heart of Africa. Regardless if it will pan out to be 100%, it is universally accepted as safe, and it is far cheaper than the millions that are being dumped into the DRC Ebola situation right now. The URL mentioned  is a peer-reviewed case study of the few cases he and his crew had managed to treat in Sierra Leone, published in the African Journal of Infections Diseases. Those treated with ozone therapy recovered. One who insisted on using the experimental Zmapp drug died quickly. After the ozone therapy was banned, a medical aide who was denied its treatment died quickly.